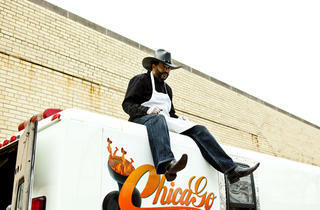 Heather Shouse profiles Troy Marcus Johnson, the owner of the city's only food truck (for now). At 45 with a wife and two kids, getting that money is the motivator. 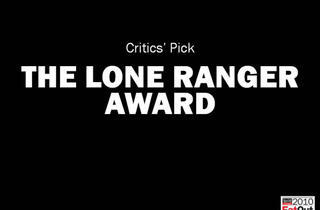 But how Johnson goes about it is what truly sets him apart. 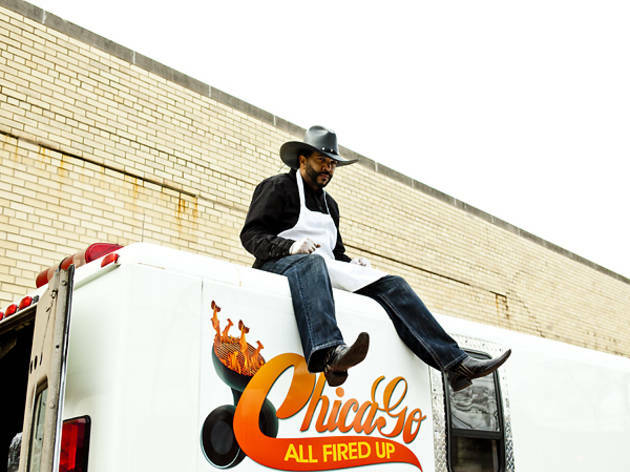 Last April, Chicago All Fired Up launched as the city’s only true food truck, right in line with the trend sweeping the nation. Sounds simple, right? But when asked about the legitimacy of this process and if it would be that easy for other would-be truck owners to do what Johnson is doing, Efrat Stein, spokeswoman for the city’s Department of Business Affairs and Licensing, refused to comment about Johnson’s particular case or how he was apparently able to sidestep the red tape. “I will say though, on the record, that the way the municipal code stands, no mobile food vendor should be preparing food on-site,” Stein says. 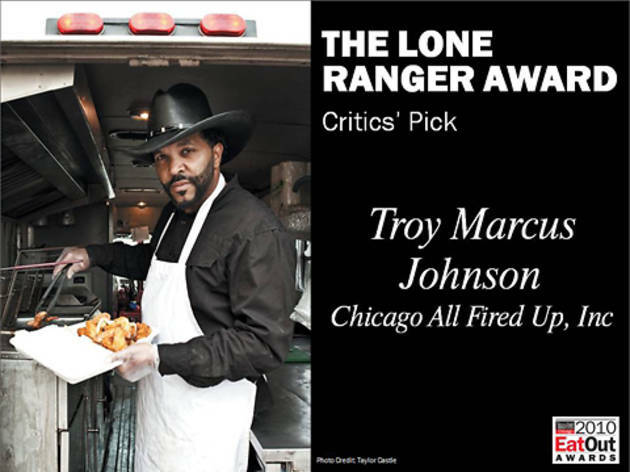 Regardless, the health inspector who gave Chicago All Fired Up the green light licensed the truck as a restaurant, and Johnson plans to continue operating it that way. 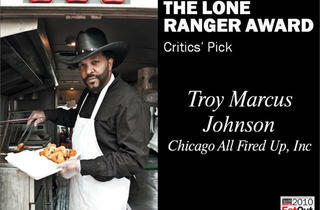 Aside from his regular Monday night/Tuesday morning stop at Green Dolphin (2200 N Ashland Ave), Johnson’s schedule takes him to Reynold’s Lounge (938 E 75th St) on Tuesdays, Vision Nightclub (632 N Dearborn St) on Thursdays, various South Side parties on weekend nights (“depending on who the DJ is”) and one-off events during the day, from a police auction a few Saturdays ago to the Best Buy parking lot at 87th and the Dan Ryan. You can keep up via Facebook, but thanks to Johnson’s perseverance navigating the Chicago Park District concessions process, he’s nabbed a summer license for the 63rd Street Beach; starting this month you’ll find All Fired Up parked in the lot at 63rd from around lunchtime to 7pm every day except Sunday. Johnson bought the business, complete with Minnie’s shrimp recipe. But he inherited all her problems along with it: building issues, landlord worries—"all kinds of stuff," he says. So in March of 2009, Johnson bought a retired fire truck from the Cicero Fire Department and used his electrical and plumbing skills to build it out. 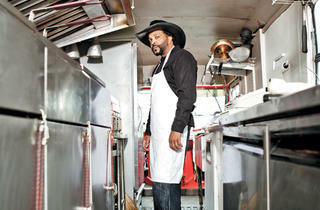 The mobile kitchen is impressive, but Green Dolphin’s clubgoers are more concerned with what’s coming out of the truck. Catfish and salmon get a crunchy cornmeal coating; shrimp, true to Miss Minnie’s tradition, takes only a light dusting of seasoned flour before they’re flash-fried; chicken wings get “fried hard,” resulting in cracker-crisp crust and perfectly juicy meat. And that massive grill (the same that kick-started Johnson’s turkey business) is attached to the back of the truck via a trailer hitch, loaded with applewood and lump charcoal that smoke rib tips for four hours after the meat soaks in Johnson’s grandfather’s marinade. 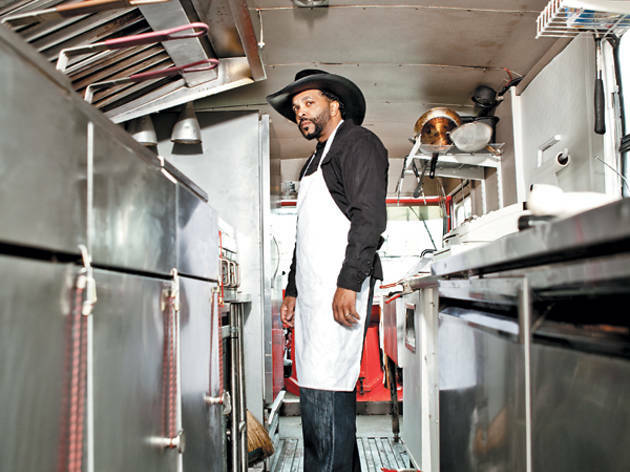 Heather Shouse’s book Food Trucks: America’s Best Kitchens on Wheels will be published in spring 2011 by Ten Speed Press.